If you’re a surfer, there’s a pretty good chance traveling is in your blood. Regardless of whether you’re taking a cross-continental flight to catch the next swell or simply searching for that untouched spot on your local stretch, the need to explore is often just as great as the need to surf, but traveling with your board can mean some unexpected consequences if you’re not prepared. For those who are planning on traveling with their board, you need to be sure you get a travel bag that can support you along the way. Whether you’re taking your favorite shortboard or your tried-and-true longboard, no one wants a ding in their board. After I spent a summer traveling with my first longboard and found my first ding from a careless baggage handler, finally understood the importance of a properly fitting travel bag. Save yourself the stress of damaged boards and check out some of the top reviewed board bags on the market below! Designed to fit up to 3 boards. Thermo-Flow Technology, World's First Wax Strips. Internal Wax Pocket, Storage Hook, 5mm High-Density Impact Foam, Heat Reflective External Material, Vent Option. Wax and UV Resistant Internal Lining, Multiple Carry Handles. This bag is cut 26.5"wide and will fit 1-2 boards. 600 Denier Poly on top and bottom. Heat and water resistant tarpaulin material. Heavy duty 10 coil zipper. Big tooth PK premium non corrosive zipper. Extra wide template fits Fish & Retro surfboards. This is by far one of the handiest bags available on the market — especially if you’re looking to save some money flying. It’s called “Smuggler” for a reason; while the bag is designed to hold three boards, a quick pre-flight check will only be able to see two. The bag includes a false bottom which keeps your third board hidden. In terms of protection, this bag includes 1Omm of AIR-Lite foam, which gives a bit of protection without all the bulk. Keep in mind, this bag is designed for three standard shortboards. you longer borders may have to take a look at Pro-Lite’s Fish/Hybrid Smuggler. For those who are looking for a snug fit for their board, Dorsal is a great name to go with. Dorsal keeps its headquarters in California and although the company has only been in business since the late ’90s, this bag is a fantastic option for surfers who travel a lot. The bag itself contains a good amount of storage for things other than your board, which is going to make your trips down to new swells a little less stressful. As for protection, this bag has 5mm high-density impact foam as well as a reinforced nose cone. If you’re only carrying one board. especially if you’re taking a longboard over a shorty. Dorsal has a solid variety of sizes available for a reasonable price. travel or Day Use – Padded – Black Blue or Red – 3 sizes For those who are looking for a bit of fun on a flat day, never underestimate the power of a good skimboard. If you’re looking to travel with it, a fan favorite is the WaveZone Skimboard Travel Bag. While this bag is pretty basic meaning you’re going to have to bring a separate backpack with all of your beach necessities. it gets the job done right. Fully padded and complete with a non-stick interior, you won’t have to worry about your board banging around during travel. This bag comes in three different sizes, meaning it’s going to fit your average board, but keep in mind that you will only have the option to carry this bag by hand. there are no straps for your back. Pro-Lite is your saving grace. This bag has 1Omm of foam for protection from the outside world, while the dividing pockets within the bag will keep your wax from damaging your board in transit. By far the best part of this bag is the fact that it’s so light. While it can carry the same boards a wheeled bag can carry, this guy weighs in significantly less -­ an empty bag only weighs about 7 lbs. The country and are simply looking for some extra protection on day trips, this is a great bag. Your board will be protected from UV damage and a good number of dings with the thick, high-quality acrylic knit, and the reinforced padded nose gives you some peace of mind. The best part about this bag is the limited lifetime warranty included in your purchase. If you’ve looked through the surfboard bags listed above and none of them leave you feeling protected enough, there are some options still available. This Curve travel bag is built with enough foam to keep your board protected no matter the situation. With 20mm of foam, it’s one of the thickest bags available. It’s important to mention, though, that the majority of the bag will have? mm of foam. only the vital areas such as the tail and nose have the 20mm. Still, not a bad buy at all! The bag is also extra wide, meaning it can fit Fish and Retro boards up to 24″ wide. In terms of finding the best surfboard travel bags, you have to use your best judgment. Finding the best new or used surfboard travel bag is all about reflecting on what you really need. What do you plan on using the bag for? How many boards do you need to carry? How far are you looking to travel? How much damage do you expect on your trip? If you’re looking to save a bit of money when you’re traveling, you need to check out Pro-Lites Smuggler bags. If you’re looking for something quick and reliable, Dakine’s knit bag is going to be a good bet. 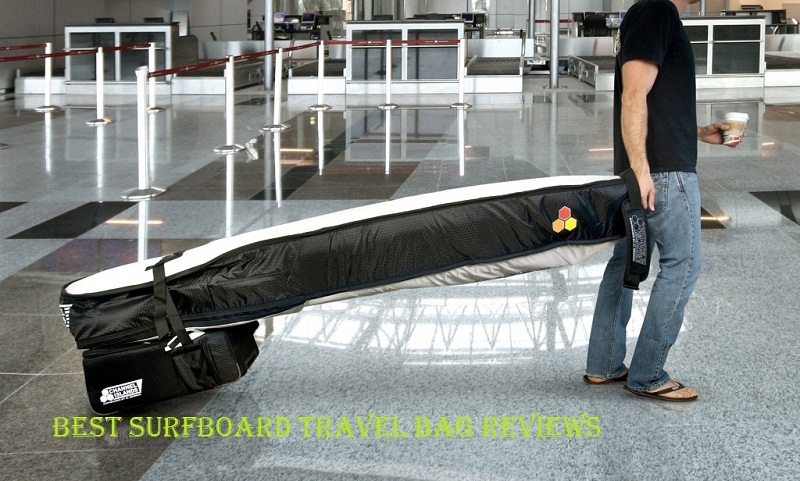 As for us, we’re going to stick to the Curve surfboard travel bag! Nothing beats the peace of mind that comes with a properly reinforced board bag. After my first ding, learned my lesson! Which board bag has been your favorite over the years? Have any suggestions? Let us know below!